We’re on the road again, but for how long nobody knows. We have no spare tire, and these are dangerous times on dangerous roads. I have never been shaken to the core like this while riding in a car. I’ve never been on a mechanical bull, but this has to be what it feels like! The only difference is this is hour after hour instead of 8 seconds! Don’t get me wrong . . . I’m not up for the mechanical bull either LOL! 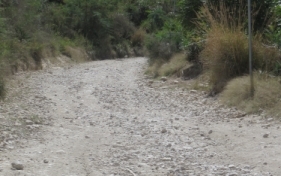 We’ve been coming down some treacherous mountain roads and crossing a few shallow rivers in the process. It’s really dry, but there are still a few rivers flowing. Glad we’re in a 4W drive, just in case we get stuck in a hole in one of these streams we’re crossing. Mercifully, there’s a town coming up, and there’s a restaurant! Look likes the menu is rice, bean sauce and goat. Hmmm, I’ve never been a fan of goat, but (once again) I’m not complaining. The goat actually tastes pretty good, and the rice and bean sauce are outstanding. Back on the hardscrabble. How does this vehicle stand the pounding. It sounds like the springs will break with every loud, jolting slam against the rocks. But there’s an end in sight. First it’s real pavement for 20 yards or so and then back to hardscrabble. Then we’re finally just on pavement. We make it around Gonaives pretty quickly, then St. Marc, and we’re now on the outskirts of Port-au-Prince. And, we’re now in a massive traffic jam. We’re in a middle lane of about 8 lanes of traffic. To our left is opposing traffic on the shoulder and another lane going our direction to the far left. You have to understand. There are no traffic rules in Haiti. You make them up as you go, and Hugues is in a hurry. First we cross to the right a couple of lanes and then to the far left. Then back to the right and then to the far left again. This guy knows what he’s doing. We’re actually going to find a way through this maze of traffic! A little over an hour later, we’re finally into Port-au-Prince. Remember, our purpose in coming is to purchase a truck for Aslan. It’s getting close to 3 PM as we’re coming up on AutoPlaza in a section of the city known as Delmas. I’m stepping out of our jeep and praying that things will go right over the next hour. They close at 4:00 PM, so there is no time to waste!